Make the most of limited time and see the best the North Bay has to offer on this perfect combination tour of Muir Woods, the artsy town of Sausalito, the Aquarium, and a night tour of Alcatraz Prison! In the morning, you'll head to Muir Woods and have over an hour to walk among the towering giant redwood trees. A quick drive through the headlands will take you into Sausalito for a chance to explore or grab some lunch. When you're ready to return, just take the ferry across the bay to Fisherman's Wharf, where you'll have time to check out the Aquarium of the Bay and learn about the life under the water. In the evening, the ferry to Alcatraz will afford you amazing views of the Golden Gate Bridge, Angel Island, Alcatraz Island, and the San Francisco city skyline from the north. When you land on the island, you’ll get a short history of Alcatraz, and then head up into the prison. The night tour allows you access to areas not available on the day tour. Wander through the ancient groves of coastal redwoods in Muir Woods National Monument and walk along the quaint sidewalks of Downtown Sausalito. Muir Woods is an example of an old-growth redwood forest located only about 30 minutes from downtown San Francisco. You will have an hour and a half to roam through this ‘living museum’ where you can get a glimpse of the towering trees that used to dominate the west coast from Santa Barbara to Washington. After exploring Muir Woods you will get a 15-20 minute narrated tour through the beautiful seaside Mediterranean-style town of Sausalito and a chance to explore (approx 45 minutes total) before returning to the city across the Golden Gate Bridge. You'll hop off the vehicle in Sausalito to enjoy a picturesque ferry ride back to San Francisco. In the evening, you'll make your way to Pier 33 to board the ferry to Alcatraz. This will afford you amazing views of the Golden Gate Bridge, Angel Island, Alcatraz Island, and the San Francisco city skyline from the north. The vessel does a complete circle around the island before docking and includes a guide pointing out different sections/buildings on Alcatraz Island from a vantage point not seen during the day. 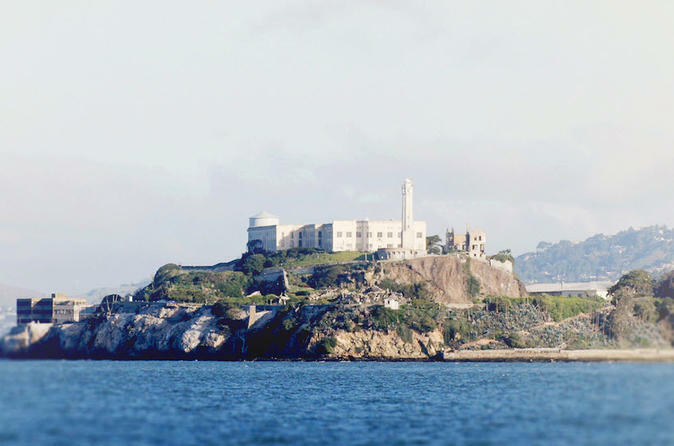 When you land on the island, you’ll get a short history of Alcatraz, and then head up into the prison! You’ll be equipped with an audio tour titled “Doing Time”, in which you’ll hear interviews from former inmates and learn more history about Alcatraz (available in 11 languages). The Alcatraz Night Tour also includes special interpretive tours and access to areas of the island that are closed during the day. You may explore for as long as you want (the ferry departs for the mainland approximately every 30-40 minutes). The tour generally takes people about two and a half hours. Don’t forget your jacket – it can get chilly out on the bay!